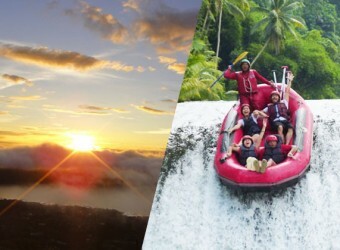 Bali Activity If you want to enjoy sunrise trekking and rafting in one day, it is the good choice! Especially, Sunrise Trekking in Mt. Batur is popular and trekking lovers visit there repeatedly to see beautiful sunrise reflecting to the surface of Lake Batur. This package is the new combination of Batur Trekking and Telagawaja River Rafting! ※Insurance for trekking is NOT included. We recommend to have international travel insurance beforehand. ※Please check transport schedule for detailed information. ※Please book over 2 people. Nusa Dua 00：00～00：30 Booking over 2 people, free transport is available. ※Booking over 2 people, free transport is avairable. ※Drop-off to airport need additional charge of Rp.100,000/person. Nusa Dua 07：00～07：30 Booking over 2 people, free transport is available. ※Booking over 2 people, free transport is available. 4：00　Start trekking. Arrive at start point and go! ※Schedule is based on approximate time. It will be changed depend on the condition on the day. 【Trekking】 Insurance is NOT included. We recommend to have international travel insurance beforehand.